The Pittsburgh Pirates head to Miller Park on Thursday, June 22, 2017 to take on the Milwaukee Brewers. The expected starting pitchers are Ivan Nova for the Pirates and Chase Anderson for the Brewers. The odds for this matchup have Pittsburgh at +110 and Milwaukee at -120. The Pirates have a 33-34-4 over/under mark and a 36-35-0 run line record. The Brewers are 44-29-0 against the run line and have a 42-28-3 over/under record. The Pirates have a 33-38 overall record this season. Starting pitcher Ivan Nova has a 7-4 record with an earned run average of 2.91 and a WHIP of 1.02. He has 54 strikeouts over his 96 innings pitched and he's given up 89 hits. He allows 8.3 hits per 9 innings and he has a FIP of 3.7. The bullpen has an earned run average of 4.04 and they have given up 254 base hits on the year. Teams are hitting .257 against the bullpen and they've struck out 228 hitters and walked 86 batters. As a team, Pittsburgh allows 9.4 hits per nine innings while striking out 7.3 batters per nine innings. They are 17th in the league in team earned run average at 4.34. The Pirates pitchers collectively have given up 671 base hits and 309 earned runs. They have allowed 83 home runs this season, ranking them 21st in the league. Pittsburgh as a pitching staff has walked 197 batters and struck out 522. They have walked 2.8 men per 9 innings while striking out 7.3 per 9. They have a team WHIP of 1.36 and their FIP as a unit is 4.22. As a team Pittsburgh is hitting .248, good for 20th in the league. The Pirates hold a .393 team slugging percentage and an on-base percentage of .324, which is good for 18th in baseball. They rank 21st in MLB with 8.5 hits per game. Josh Harrison is hitting .293 with an on-base percentage of .366. He has 76 hits this season in 259 at bats with 23 runs batted in. He has a slugging percentage of .452 and an OPS+ of 114. Andrew McCutchen is hitting .268 this year and he has an on-base percentage of .343. He has totaled 69 hits and he has driven in 43 men in 257 at bats. His OPS+ is 116 while his slugging percentage is at .494. The Pirates have 600 hits, including 112 doubles and 68 home runs. Pittsburgh has walked 245 times so far this season and they have struck out 518 times as a unit. They have left 514 men on base and have a team OPS of .717. They score 4.28 runs per contest and have scored a total of 304 runs this year. Milwaukee has a 38-35 overall mark this year. With an earned run average of 2.92, Chase Anderson has a 5-2 record and a 1.15 WHIP. He has 77 strikeouts over the 83.1 innings he's pitched. He's also given up 71 hits. He allows 7.7 hits per nine innings and his FIP stands at 3.38. The bullpen has an earned run average of 4.48 and they have given up 248 base hits on the year. Teams are hitting .249 against the Brewers bullpen. Their relievers have struck out 249 batters and walked 130 opposing hitters. As a team, Milwaukee allows 9 hits per nine innings while striking out 7.9 batters per nine innings. They are 16th in the league in team earned run average at 4.29. The Brewers pitchers as a team have surrendered 658 base knocks and 315 earned runs this season. They have given up 89 home runs this year, which ranks 16th in Major League Baseball. Milwaukee as a staff has walked 257 hitters and struck out 577 batters. They give up a walk 3.5 times per 9 innings while they strike out 7.9 per 9. Their team WHIP is 1.38 while their FIP as a staff is 4.43. As a team, they are batting .251, good for 19th in the league. The Brewers hold a .443 team slugging percentage and an on-base percentage of .323, which is good for 19th in baseball. They rank 18th in MLB with 8.6 hits per contest. Domingo Santana comes into this matchup batting .264 with an OBP of .358. He has 62 hits this year along with 35 RBI in 235 AB's. He maintains a slugging percentage of .455 with an OPS+ of 110. Eric Thames is hitting .254 this season and he has an OBP of .386. He has collected 58 hits in 228 at bats while driving in 38 runs. He has an OPS+ of 148 and a slugging percentage of .583. 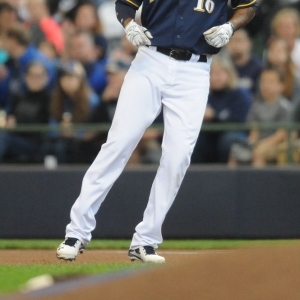 The Brewers as a unit have 628 base hits, including 136 doubles and 105 homers. Milwaukee has walked 242 times this year and they have struck out on 703 occasions. They have had 482 men left on base and have an OPS of .766. They have scored 4.81 runs per game and totaled 351 runs this season. Who will win tonight's Pirates/Brewers MLB game against the spread?